Like many Americans, I have watched with some amazement at the rise of AOC and other forces on the left, often under the guise of "socialism". But does anyone know what it means? And boy, are these extremely different. Consider, the classic book The Road to Serfdom, which argued that a planned economy (socialist under definition  above) would invariably lead to a loss of freedoms, also contained explicit exceptions for the policy aims of a welfare state, so long as it was done within the context of a capitalist economy. But is this true? 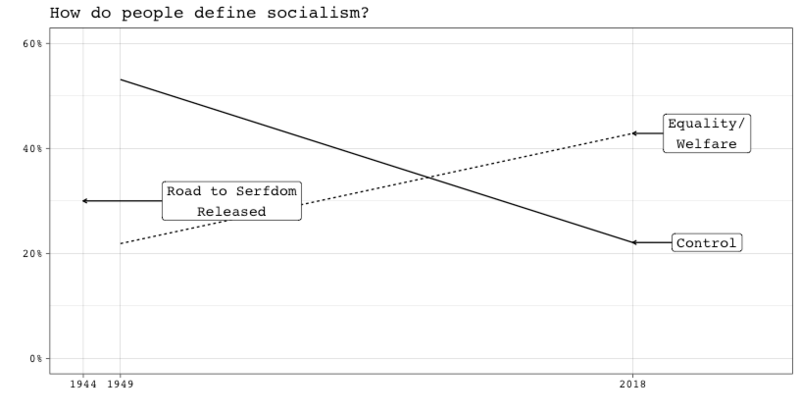 At the time I wrote that tweet, I didn’t have any data to back up my assertion — I had just recently read The Road to Serfdom so I had a fairly good idea at how socialism was viewed then; and I follow the political discourse so had an intuition about how it’s viewed today. Turns out, according to Gallup data from 1949 and today, that my intuition was luckily right.